Three-quarters of Americans prefer to get their news from TV, which is still considered the most trusted medium, according to research from InkHouse and data-collection company GMI. WALTHAM, MA: Three-quarters of Americans prefer to get their news from TV, which is still considered the most trusted medium, according to research from InkHouse and data-collection company GMI. The "Watch It, Read It, Tweet It" study explored the changing habits of news consumption and sharing, based on a survey of 1,000 US adults that was conducted in January. While 73% of respondents prefer TV for news consumption, 37% of those who consider themselves tech-savvy trust TV, compared with 50% of those who do not consider themselves tech-savvy. Email is the most popular method for sharing news, listed by about one-third of respondents (34%), closely followed by social media at 29%. A similar number of respondents (27%) said they do not share news. 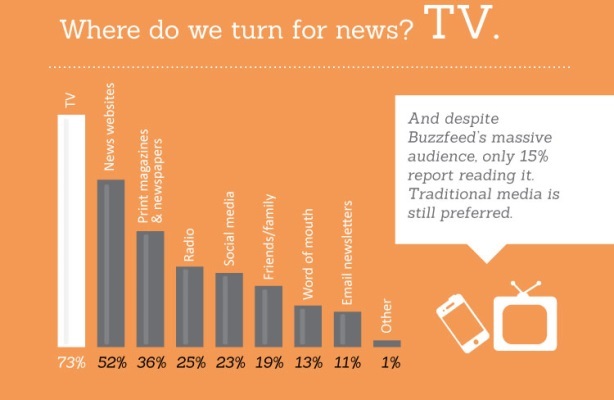 The most shared type of news content is breaking news, spread by 41% of respondents. It was followed by humorous events (14%), informational pieces like how-tos (13%), thought pieces (12%), and cute animal photos (12%). Just over half of respondents (54%) said the main reason they share news is to inform. About one-quarter said it is to entertain. "As communications professionals, we live in a world of what’s next. We are the first to adapt, but we are in the minority, and what came out of this is that the average person still prefers news from TV," said Beth Monaghan, co-founder and principal of InkHouse. While there is some industry debate about whether companies should continue to issue press releases, the survey showed they are a more trusted method of communication by a company than posts authored by a CEO. One-third (33%) of respondents trust press releases, while 16% trust articles written by the CEO; 4% trust blog posts made by a CEO, and 3% trust advertisements. Almost half (45%) of respondents said they do not trust any source of company-generated news. The study found that six in 10 Americans read or watch the news every day, consuming three to ten stories. Respondents over the age of 55 are more likely to consume news more frequently, with just under three-quarters of this age group (72%) reading or watching it daily. According to the survey, almost half of Americans (45%) read entire articles, despite the proliferation of social media, while four in ten (39%) read a headline and the first few paragraphs. While many reports have shown that social media harms attention spans, the survey confirmed that people still like long-form content, said Monaghan. "That means you have to find a way to break through the din of social media – getting content noticed is the new game," she said.